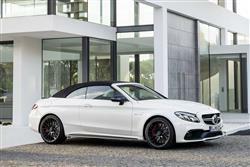 Mercedes' C-Class Cabriolet model line-up is topped off by this improved and now even more desirable C 63 high performance V8 variant. Toupees will need to be very well tied-down indeed. 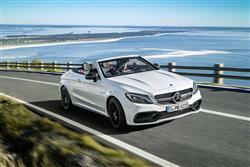 Mercedes' C 63 Cabriolet is the only model in its sector with an 8-cylinder biturbo engine - yes, the one used in the brand's AMG GT supercar. Here, that unit powers the very top version of the C-Class Cabriolet, which goes head to head with rivals like BMW's M4 Convertible. If your recollection of AMG open-topped models is that they go very fast but don't particularly like going round corners, this one will surprise you too. And it's been usefully refettled in this improved guise. On the move, this car is everything you'd want it to be, with aural fireworks and spine-tingling acceleration that flings you up the road with urgent, angry aggression. The SPEEDSHIFT MCT auto gearbox now gets 9 speeds and its 'RACE START' function makes it easy to replicate Grand Prix-style starts that'll take 4.2s in the standard 476hp model. 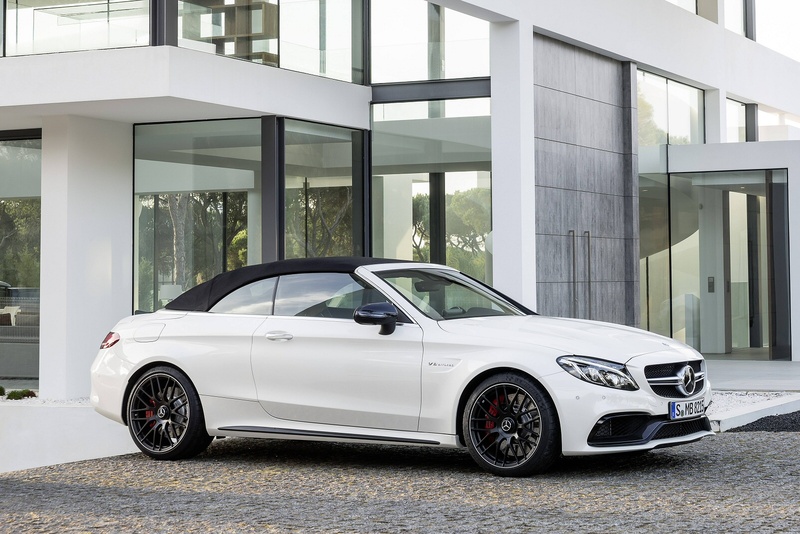 Or 4.1s if you go for the uprated C 63 S Cabriolet variant that offers 510hp and 700Nm of torque, enough to pummel a rival BMW M4 Convertible into submission. Both versions use much the same V8, a twin turbo 4.0-litre engine that's impressively efficient for its size. Top speed is 174mph if you opt for the AMG Driver's Package. A rear limited slip differential is standard and you'll need it to properly get the power down through the bends. 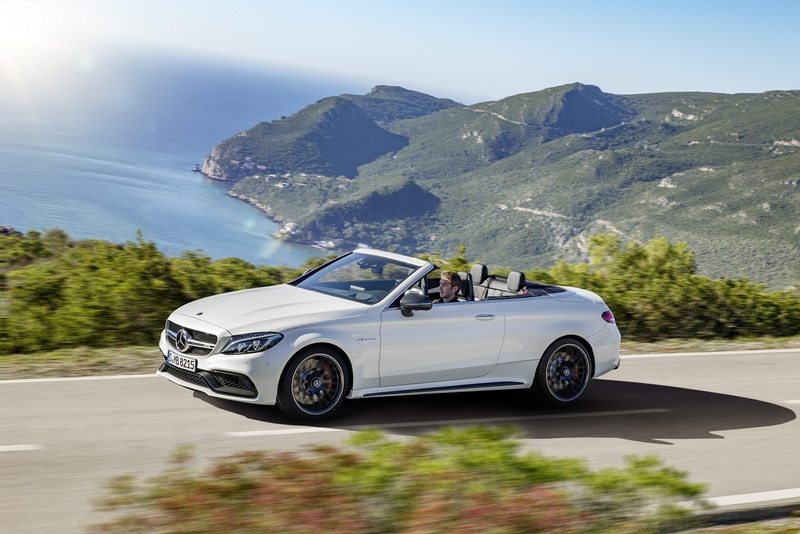 As before, buyers aren't offered the 4MATIC 4WD sytem you get in the lesser V6 C 43 Cabriolet model, so it's rear wheel drive only; which can lead to a few tense moments when cornering in the wet. C 63 buyers do get adaptive suspension though, one of the elements that can be tweaked via an 'AMG DYNAMIC SELECT' driving modes system that can alter steering feel, throttle response, gearshift timings, stability control thresholds and even the exhaust note via 'Comfort', 'Sport' and 'Sport+' settings. No matter how you fiddle with these, the ride remains coarse, but the steering's good, the brakes are excellent and the gearshift response is rifleshot-quick. It's an experience to savour. With its top up, the profile of this two-door cabriolet resembles that of the C 63 Coupe, with virtually identical basic dimensions. That means you get the same striking front end featuring increased track width on the front and rear axles and flared wheel arches. 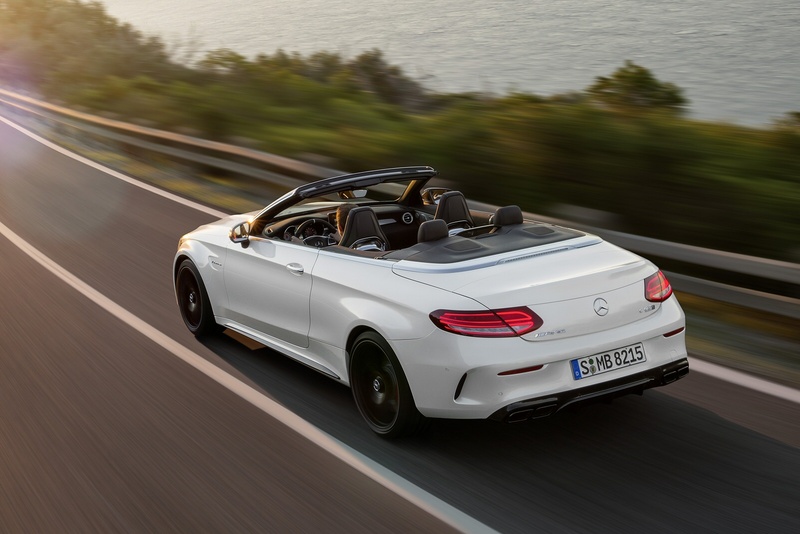 These make the AMG Cabriolet 64mm wider at the front and 66mm wider at the rear compared with the standard Cabriolet, enabling the vehicle to hug the road better. Two striking powerdomes adorn the 60mm longer aluminium bonnet, underscoring the powerful looks. Subtle aesthetic changes underscore this revised MK2 model C 63's visual identity. The AMG-specific radiator trim sports vertical louvres in high-gloss chrome and a re-styled front apron features a sleeker 'A-wing' design. In profile, there are sporty side skirts plus aerodynamically optimised AMG light-alloy wheels, while at the rear, the twin tailpipes sit in a more expressive diffuser. The fully automatic fabric soft top can be opened and closed using a matt chrome curved switch on the centre console. The process takes less than 20 seconds up to a speed of up to 31mph. After opening, it folds down quietly and is stored in the soft-top compartment in the boot. Inside, the high-grade materials and build quality are everything you would expect from a Mercedes cabriolet. Inside, the main change is the addition of a fully digital 12.3-inch instrument cluster in front of the driver which brings the vehicle functions directly to life with the three AMG-specific display styles - 'Classic', 'Sport' or 'Supersport'. 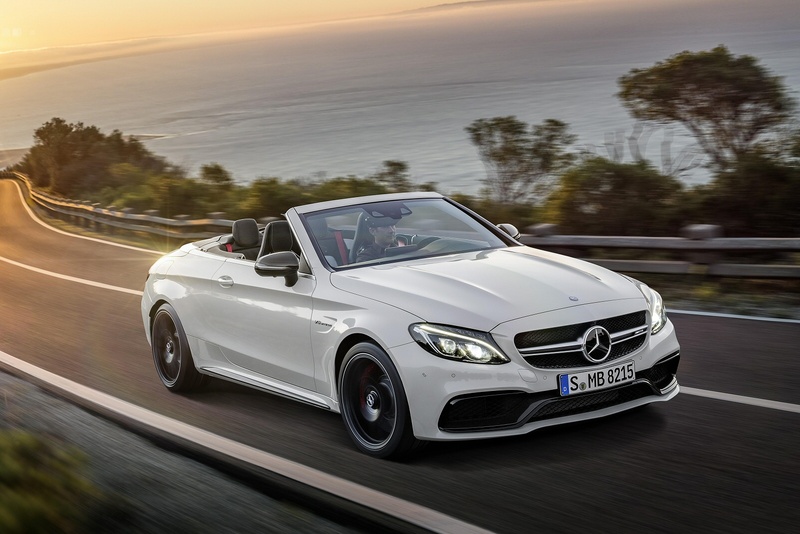 Most owners will want to specify the optional AMG Performance seats, which provide optimum lateral support when adopting a dynamic driving style thanks to the special design of the seat side bolsters of the seat cushion and backrest. The rear pews are in the form of individual seats. Their backrests offer a through-loading feature, can be split 50:50 for high everyday practicality and can be completely folded down. This extends boot capacity which is 355-litres - or 260-litres with the roof open. Think in terms of needing around getting on for £73,000 for your C 63 Cabriolet, once you've allowed for a few well-chosen extras. And there'll be a premium of around £9,000 if you want the uprated 510hp 'S' version. This gets an electronic (rather than a mechanical) limited-slip differential, dynamic engine mounts that offer extra cornering feedback, an extra 'Race' mode for the auto gearbox and bigger 19-inch wheels featuring larger brake discs and red callipers. Inside a C 63 S, you'd get grippier AMG Performance seats and an even classier AMG steering wheel that blends DINAMICA microfibre with the standard Nappa leather for a DTM-style feel. Should you want to go further, you could also specify a powerful Burmester surround sound system or, for those wanting a soundtrack straight from Affalterbach, the option of a variable AMG exhaust. There's also the incredible LED Intelligent Light System to consider. 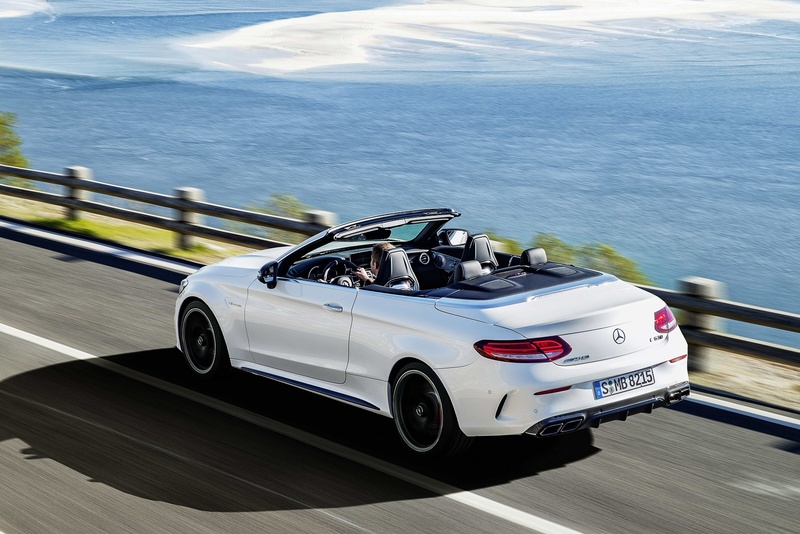 We particularly like the sensitive climate control system that adapts itself whether the car is being driven with the roof up or the roof down. A key option you really have to have on this car is the 'Cabriolet Comfort package'. This gives you two key features; the electric AIRCAP draught stop system that reduces the interior turbulence for rear passengers at the press of a button. And the AIRSCARF neck-level heating set-up for the driver and front passenger. Alternatively, there's also the option of a retrofitted manual folding draught stop behind the front seats. This noticeably stops draughts in the front seats. Even this V8 engine is Euro6-compatible and gets an ECO start/stop function. As a result, it's supposed to be able to achieve as much as 31.7mpg on the combined cycle and up to 236g/km, pretty impressive for a car of this performance. So how have the engineers from Affalterbach done it? Well by clever design of the 'M177'-series 4.0-litre V8 biturbo powerplant, developed as part of Mercedes' BlueDIRECT' engine family. The neat element here lies in the fact that the two turbos have been moved from their usual position on the outside of the cylinder banks and placed instead within the cylinder 'V'. That means this Euro6 engine can be smaller, slighter, more responsive and cleaner. More efficient electro-mechanical steering and an engine stop/start system also help. Of course, as a driver, you'll need to do your part here. The quoted figures assume that the SPEEDSHIFT MCT transmission is operating in its most relaxed 'Controlled Efficiency' mode that gives you softer gearchanges and a more restrained engine note. At cruising speeds in this setting, a 'Gliding Function' will also be activated that temporarily de-couples the engine from the drivetrain when you lift off the throttle. If you�re looking for a new Mercedes-AMG C-Class C63 S 2dr 9G-Tronic Petrol Cabriolet for sale, you�ve come to the right place. At Bristol Street Motors we don�t just have the best Mercedes-AMG C-Class C63 S 2dr 9G-Tronic Petrol Cabriolet deals, we also offer friendly advice and help with all your enquiries to ensure your buying experience is a happy experience.